For many indigenous communities that have lived in the Arctic for millennia, sea ice has been an integral part of their living environment. As a place where they have spent a significant part of their lives hunting, fishing and even dwelling on the ice, the intimate understanding of sea ice the Inuit and other indigenous communities have has allowed these communities to survive and even thrive in the Arctic for millennia. This understanding of sea ice has been passed down from generation to generation through indigenous languages rich in highly specific terminology pertaining to sea ice and sea-ice related phenomena, as well as by firsthand experience on the ice. However indigenous sea ice knowledge and use in Inuit and other indigenous communities in the Russian Far East and western Alaska who use sea ice has been changing in recent decades. The reasons for these changes are numerous and include not only climate change, but also numerous sociological factors that have influenced the transmission of their special knowledge from older generations to younger generations. Yet it is important to keep in mind that the extent to which climate change and sociological factors have influenced sea ice knowledge and use differs widely from place to place. Climate change has not affected indigenous communities across the Arctic uniformly, and the influence of sociological factors varies from community to community. Local sea ice in many areas of the Arctic freezes up later in the autumn and breaks up earlier in spring than it used to, shortening the amount of time during the year during which one can safely go out onto the ice. Since sea ice has less time to thicken, the sea ice in many parts of the Arctic has become less reliable as a means of transportation. In some parts of the Arctic centuries-old travel routes across the sea ice have been re-routed to areas where the ice is still solid. The overall reduction in Arctic sea ice cover has shrunk the size of the natural habitat of many marine mammals such as seals, walruses and polar bears, which many Inuit and other indigneous peoples hunt as a primary food source. Communities being obliged to end their traditionally nomadic way of life and settle in one particular area. 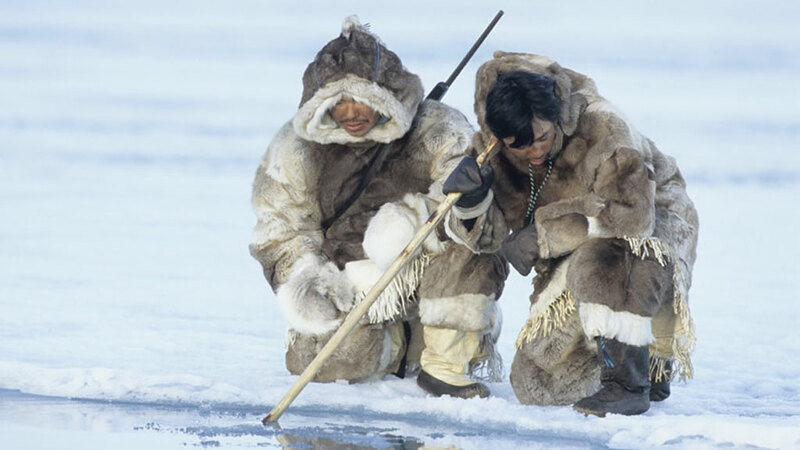 The introduction of a cash economy and five-day work week, which limits the time indigenous peoples can devote to traditional activities normally done on the ice such as hunting and fishing. The introduction of modern conveniences such as stores, which replaces the need to go out hunting everyday. The introduction of snowmobiles, which replaces dog sleds, and GPS systems, which circumvents the need to rely on indigenous knowledge to navigate while on the ice. The decline in use of the various dialects of the Inuit and other indigenous languages, which hold a great deal of information about sea ice and sea ice-related phenomena. In order to better understand the phenomenon and investigate the reasons behind the changes, one IPY project (n° 166), called Sea Ice Knowledge and Use (SIKU - which is also the most common word for sea ice in all Inuit languages from the Bering Strait to Greenland) is having a look at how Arctic residents are using sea ice and ice-covered habitats, how often and for what purpose, and whenever possible comparing indigenous sea ice knowledge and use of today with that of the past. Included within SIKU are a number of initiatives, including the creation of sea ice dictionaries, which is aimed at preserving the wealth of knowledge stored in the rich lexicon of the Inuit, Yupik and other indigenous languages. By taking a "snapshot" of the current situation of indigenous knowledge in the Arctic, it will help Northern communities find ways to deal with climate change and provide a set of baseline data for any future researchers and future Arctic residents alike. The SIKU project has been employing local residents to observe and document environmental changes in the Polar Regions in addition to collecting climate and weather data. The project provides an umbrella framework bringing together several dozen sub-projects as well as anthropologists, human geographers, sea ice specialists, climate scientists, marine and ecosystem biologists from various countries including the US, Canada, Russia, Greenland, and France in partnership with almost two dozen indigenous communities in the Russian Chukchi Peninsula and Alaska, Arctic Canada, and Greenland. The three-year IPY research effort was launched in 2006-2007 as a collaborative effort that involved scientists from five nations (US, Canada, Russia, Greenland, and France) and indigenous experts from over 30 communities across the Arctic. A book summarizing the main outcomes of the SIKU project is in preparation and will be released by the time of the June 2010 IPY conference in Oslo, in which scientists will discuss their findings from the IPY. Climate change has not affected indigenous communities across the Arctic uniformly.